There are a number of stories circulating about Hawass's resignation from his post as Antiquities Minisiter in the government formed following the resignation of Mubarak. Please note that although on his own blog (drhawass.com, see below) there is the transcript of an interview in which he confirms that he has resigned he has not, unless I have missed an official statement, indicated that he has formally resigned (i.e. offered formal resignation to the current governement). He has only signified that if he is asked to join the new cabinet he will not do so due to current security conditions. Whether or not this means that he would retire from the antiquities service as a whole is unclear. Hawass appears to have made no statements about his plans for the future. The enthusiasm he has demonstrated for his prominent role in the past, together with his enjoyment of the media and his conviction that the public want him to have a dominant role in the management of Egyptian antiquities would all argue that his plans would probably still lie in the same area. It seems that the allegations of corruption are also part of his reasoning, but if those were acted upon they would presumably follow him into whichever role he takes on in the future. It should be added that in the interview posted today on his website he indicates that he might return to the role of Minister if the country was stable and the antiquities safe. There is the hint of a suggestion in all of this that if the government give greater powers of protection to the police at the sites he might revise his decision, although he may have lost a few government friends with some of his recent remarks. It seems a shame that he does not want to use his current role as a way of enforcing the safety of the monuments for which he assumed responsiblility rather than resigning and waiting for someone else to do it. On the upside, the publicity surrounding his resignation has certainly brought attention to the situation and that's important and may have been part of his intention. Hawass has always been skilled at getting the attention of the media. Many official and unofficial statements have called upon Egypt to do something about its current difficulties. Hawass has so far rejected outside assistance but perhaps it is time for Egypt to reconsider that position. If Egypt cannot secure its heritage due to its current problems perhaps the time has come to ask for short-term emergency help. There has been a call for Hawass to stay in his position (see Ahram Online piece below). Protestors gathered at the Giza Plateau to ask for Hawass to stay. Q: Dr. Hawass, during many years you have been the image of modern Egyptology. Why are you leaving now? A: “I am leaving because of three important reasons. The first reason is that, during the Revolution of January 25th the Egyptian Army protected the antiquity sites. And they protected Cairo Museum. But in the last 10 days the Army left. Actually, they have other tasks to do. Those who are now in charge of the protection of the antiquity sites are the Tourist Police. But there is no Tourist Police to protect the sites. Therefore, what happens? Egyptian criminals, thieves (you know, in every Revolution bad people always appear…), began to destruct tombs. They stole a tomb at Saqqara (the tomb of Hetepka) another tomb at Abu Sir (the tomb of Ptahshepses), another tomb at Giza. They attacked a storage magazine at Saqqara, they opened all the storage magazines. We don’t know how many artefacts are missing. They opened 2 storage magazines at Giza. One tomb dated 19th Dynasty, actually it is only one in the Delta. It was destructed, at Ismailiya. A store at El-Qantara-east has been broken and they took antiquities. They began to build houses, they began to excavate at night, everywhere. I had to write a report and to send it to the Director of UNESCO. That’s why at the Egyptian cabinet, yesterday, I had my speech and I said: “I cannot stay in Egypt and see antiquities being stolen, and I cannot do anything”. This is not me! I have been always fighting to return artefacts. I did fight Ahmed Ezz, the man in the Parliament, who was the most powerful man: he wanted antiquities to be sold in Egypt. The second reason: crooks in the Antiquities Department. There are two of them… They have been accused of stealing antiquities. They have been accused of doing illegal things, all the time… Their files talk about this. A third person was a professor at the University who stayed almost 6 years as Antiquities Director, and he never did anything. As a corrupt man, he even signed for a rich lady from an Arab country to take manuscripts out of Egypt. These 3 people brought kids against me, to shout that they need jobs. I cannot give a job to everyone… They began to say in Egypt that I am stealing antiquities. How? How a man who gave his life to antiquities can steal antiquities? Therefore, I found that if I stay for six months from now in Antiquities, I will never be able to protect antiquities and I’ll never be able to work during this mess… During all my life, I have been excavating, discovering, writing books, giving lectures all over the world. Actually, I am responsible for bringing many tourists to Egypt, because of all the activities that I did. But, at the same time, now I cannot do this! Therefore, I decided to resign”. 1. During the earlier protests, Egyptian youths and the police protected the museums and monuments. Only the Egyptian Museum in Cairo was broken into and, thank God, all the important objects inside it were safe and only a few things were lost or broken. A report of exactly what is missing is still being compiled, however. Magazines were looted, but after initially appearing to get back to normal, the situation has recently become worse and there are many reports of thefts and illegal excavation. 2. Since the revolution, many people have continued to protest over other things, such as against me over jobs and salaries. Unfortunately, it is not possible to provide everything that everyone is asking for. In the Ministry of State for Antiquities, we need money to protect sites and to restore buildings and objects too. We need the money brought in by tourists who visit our sites and museums to fund these things and, at the moment, there are no tourists. 3. Crooks in the Ministry and at the University of Cairo have started to attack me personally. I cannot stand this! Most importantly, however, is that there are not enough police to protect the sites. I hope that my resignation will put pressure on the government to do something about this and also encourage the international community to do so as well. The Egyptian antiquities that are on tour at the moment are safe and kept so with contracts. They are completely safe and when the police are back in force, everything here will be protected properly again too. Egyptian newspapers yesterday widely quoted the fedora-wearing TV personality saying he was not willing to participate in the government of Essam Sharaf, named as the new Prime Minister by the military on Thursday, after the Mubarak-appointed Ahmed Shafiq resigned. Dr Hawass told the Al-Masry-Al-Youm newspaper: "I will not return to the ministry again. During my life, I have never felt weak until the period which I assumed my position in the Ministry of Antiquities." His statements appear to contradict an interview with The Independent last month, when he insisted Egypt was fully able to look after its treasures, which include the tombs in the Valley of the Kings, the pyramids of Giza and the Pharaonic treasures at the Egyptian Museum in Cairo. Egypt is putting together its first post-revolutionary government, but Zahi Hawass will not be a part of it. The crusading Egyptologist and antiquities minister has announced his intention to resign. Though he has not reported this on his frequently updated blog, he spoke to media outlets yesterday and today. Egypt's prime minister, Ahmed Shafiq, resigned yesterday, and his replacement, Essam Sharaf, has been asked by the army to form a caretaker cabinet. "If the government will ask me again, I will not accept this job," Hawass told the New York Times yesterday. Today he said to CNN that the police have been unable to protect Egypt's cultural heritage and that his resignation "is a protest, really, that not enough can be done now to protect these sites and treasures." Zahi Hawass, minister of state for antiquities, has warned he will resign if asked to hold Egypt’s antiquities portfolio in the new cabinet led by Prime Minister Essam Sharaf. Hawass told Ahram Online that his decision was taken following the failure of police to protect Egypt’s antiquities and archaeological sites. “I cannot be the protector of Egypt’s antiquities when they are subjected to looting like that because of the police's absence,” Hawass told Ahram online. At the footsteps of the Great Pyramid in Giza, in the garden of the Egyptian Museum in Tahrir, and before the façade of Luxor and Karnak temples, hundreds of protestors gathered asking for the continuation of Zahi Hawass in his current post as minister of state for antiquities affairs. Yesterday Hawass warned that he will resign if asked to hold the antiquities portfolio in Essam Sharaf’s cabinet, due to police failure to protect Egypt’s antiquities. He said he could not be the protector of Egypt’s antiquities when the police remain absent. Last week, police failed to protect several antiquities and archaeological sites. Mostafa Waziri, head of antiquities on Luxor’s West Bank, told Ahram Online that Hawass is very capable. During his tenure as secretary general of the Supreme Council of Antiquities (SCA), which commenced in 2002, Hawass did a lot not only for archaeology but for archaeologists as well. It would be impossible for Zahi to "offer formal resignation to the current governement". My understanding is that the cabinet fell when Shafik was removed as PM. All ministers lost their jobs along with Shafik whether they liked it or not. There was no question of their needing to offer their resignation, same for Zahi as for anyone else. The question for all ex-ministers would then be whether the new PM would ask them to join the new cabinet, and second, whether they wanted to do so. ZH said that he would not accept a position if it was offered to him. There's obviously uncertainty around a lot of this, but there's no need to read much significance into his non-resignation. Me thinks he wants to be begged to stay. Plus he thinks it will help to just call attention to the problem. Either way, he's doing what he does best. Getting that attention. Prior to Dr. Zahi Hawass being head of the Egyptian Antiquities Dept (SCA), it was slow to get things done to conserve and manage the monuments and antiquities in Egypt. Since his appointment Egypt has a solid plan for conservation and management of the sites, there is new training to increase the involvment and expertise of Egyptians in the field, antiquities have been returned to Egypt from other countries, new standards have been implemented, new modern museums are being built, there are now nicer and cleaner sites with improved facilities for tourists, and of course, during his tenure there has been many, many exciting new discoveries. Zahi has worked tirelessly to protect Egypt''s cultural heritage throughout his tenure. THESE are the important things to remember about Dr. Hawass' work. Thanks for the comment Tomas,and for offering a good clarification of the political situation. The point I was trying to make is that Hawass has effectively made it clear that unless conditions change significantly his statement that he will refuse a position in the new cabinet would equate to a resignation, as he himself suggests. You're quite right that there is a lot of uncertainty but I do see his statements as significant. Thanks Andrew. I think that you're right that it is easy to forget the good that Hawass has done. His self-promotion and rhetoric sometimes bury the fact that has had a positive influence in some important areas. This was a revolution of the young for the young and not for everyone. The youth of Egypt do not remember 56,67,73,81. When you overthrow your leader, then do not ask where your government is getting the Egyptians out of Libya. You have no government. You overthrew it. Remember? Once cannot have his cake and eat it, too. With Mubarak he went after Islamist extremists and maintained peace with Israel. Ask you fathers what life was like in 1967. They remember. So the youth today overthrow their corrupt leader and now let Iranian ships through the Suez. When you bring Iran to the table, Hezbollah will follow. Zahi Hawass is simple a reminder of corruption. It is so unfortunate that the youth will not see him but a reminder of a corrupt leader. This is the best time for him to step down but NOT step out. He has given Egypt to the world. He has brought tourism to Egypt and the world will watch Egypt struggle trying to bring tourism BACK to Egypt without the help of Dr. Hawass. Egypt, go with the way of God, but 'trust in God- but lock your car." Do not make foolish decisions. Look to your elders for their wisdom and experience while you form a new Egypt. Losing Hawass was a grave mistake. However, it is only one of many things that the youth government will have to reconcile with. Do not wake the sleeping giant to the North. Be wise. And most of all is if you have not inherited the corruption from your leader then print this. If not then you might be destined to being the sandbox of Africa. I have been/lived in Egypt. Be kind to it and it will be kind to you. All the best. He can do even more good by getting out. It is time for someone else to lead the way. Andie should move on too. Enough of her bleeding heart for hawass. No, anonymous, my heart is certainly not bleeding for Hawass. I think that he is largely responsible for getting himself into this mess, and for alienating a lot of people with publicity seeking and his recent infuriatingly contradictory statements, but at the same time it is just silly to ignore the fact that along the way he has done some good for which he should be credited. I really don't think that anyone anywhere has said that he didn't do a WHOLE LOT of good. He does rub a lot of people the wrong way a lot of the time. That's just him. He's an egotist. But he's damn good at what he does. I said here the other day that it would be awful without him. That doesn't mean that he should stay. I don't know if the charges against him are true. If any of them are true, he needs to be replaced, no matter what. And if he stays he needs to learn when to keep his mouth shut. But that will never happen. We get him as is or not at all. 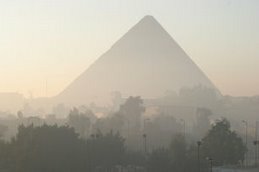 This blog was set up in 2004 to aggregate news about Egyptology and related topics from online sources on a regular basis. It was closed finally in September 2013 due to other commitments. It has been left open as an archive, but comments have been disabled.